How do I collect a water sample to submit it for analysis?How do I collect a water sample to submit it for analysis? Sample Bottles: Bottles should be clean. Use a 16 oz. plastic water bottle. Sampling Technique: Before filling, rinse the sample bottle out three times with the water being collected. Fill the bottles completely and cap tightly (Don’t leave air space at the top if possible). Sampling Timing & Location: Water should be collected at the same depth (if pond, river, stream, etc.) or location (e.g. pump). Collect sample at the same time of day water is used to irrigate crops. If collected from the end of irrigation lines – let the line flush sufficiently before collecting the sample (wait 2 minutes or so after irrigation system turns on to collect from the bypass or at a sprinkler head). Sample Handling and Storage: Avoid sample agitation and prolonged exposure to air. Identify each bottle by attaching an appropriate label (Date & time collected, location, your name/operation). Store the sample in cool/dark location (i.e. refrigerator (best) or in a cooler on ice) until submitting to lab for analysis. IF sending sample to a lab – ship overnight with samples kept cold in an insulated shipping container with ice-packs. Sample doesn’t need to be frozen – but needs to be kept cold in the dark to reduce changes in sample composition between sampling time and analysis by the lab. Submit the sample(s) for analysis as soon after sampling as possible. Ideally the samples should be analyzed within 24 hours of sampling. Where can I get my irrigation water checked for Pythium or ...Where can I get my irrigation water checked for Pythium or Phytophthora spores? 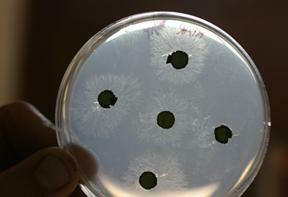 Eucalyptus leaf discs for baiting Phytophthora are placed onto a selective agar culture medium to test for the presence of the pathogen (the thread-like rings around the leaf discs). Photo by Dr. Robert Wick, University of Massachusetts. Check whether your state university extension plant diagnostic lab can run the sample. For example, the University of Massachusetts Plant Diagnostic Clinic plates out water samples to test for Pythium and Phytophthora to the genus level. You can also send a sample to the University of Guelph, which does a DNA fingerprint-type analysis for a range of pathogens down to the species level. The Florida Nursery Best Management Practice for fertilizer applications is explained by Dr. Tom Yeager of the University of Florida IFAS Extension. Professor Paul Fisher (University of Florida) discusses how to monitor different aspects of water quality using both onsite tests and laboratory analysis. Paul Fisher (University of Florida) provides information on water quality in floriculture crop production.